QUEENS — A new restaurant serving up handmade dumplings and noodles opened in downtown Jamaica Tuesday, bringing new flavor to an area dominated by fast-food chains. Everything at Beijing Dumpling House, a new eatery at 88-38 Sutphin Blvd. near the Queens Civil courthouse, is made from scratch, according to manager Amy Zhang. The restaurant specializes in dumplings, either pan fried or boiled, including chive and pork, cabbage and pork, vegetable, shrimp and chicken and basil varieties. Four pan fried chive and pork dumplings cost $1.50 and eight boiled shrimp dumplings go for $5. 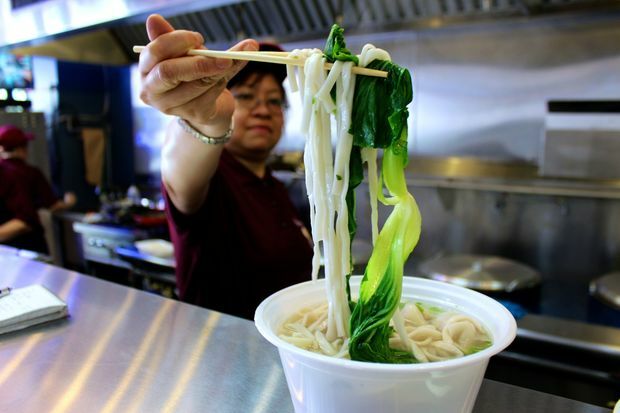 The 36-seat eatery also offers house-made noodles, served with various sauces or in soup, Zhang said. Prices are $3.75 for noodles with sesame sauce and $5.50 for beef noodle soup. Also on the menu are mushrooms and pork ban and sesame pancakes with different toppings like egg, Peking duck and vegetables. Bubble teas are also available for $2.50 and smoothies for $3. On its first day, Zhang said, the restaurant served well over 200 customers, he said. Wanda Howell, who was dining on Tuesday, said she was glad the menu includes a number of boiled options. “I try to watch what I eat,” said Howell, who works at the courthouse. Local business leaders called the new spot a welcome addition to the neighborhood. “It’s something that we are constantly looking to have in the area — better sit down restaurants,” said Simone Price, executive director of the Sutphin Boulevard Business Improvement District. “It’s exciting to have different types of eateries in the area,” Price noted.